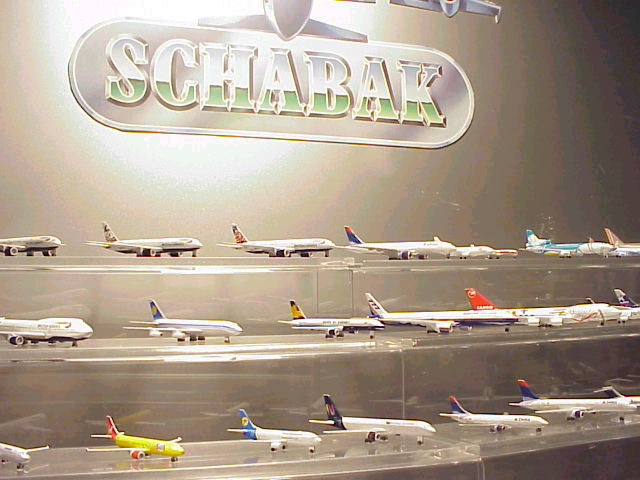 Schabak took over the assets of Schuco and began to produce their first 1:600 scale die-cast model airliners in 1982. They were based in Nuremberg, Germany and utilised an army of grannies to apply decals to the metal bodies of the models. 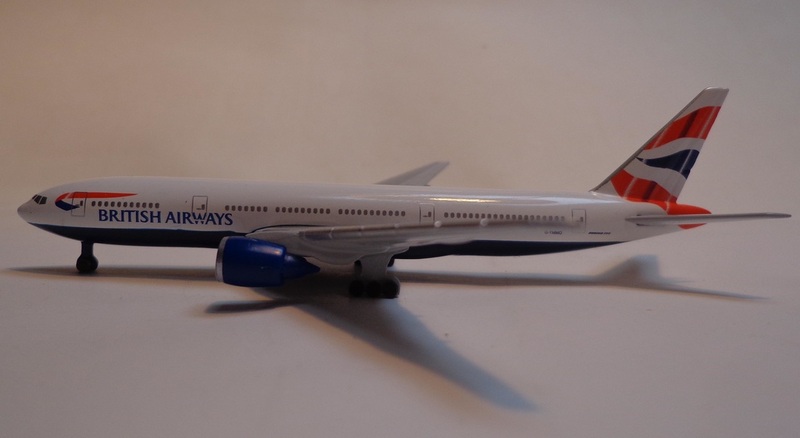 This led to a high variability in the quality of models produced but nevertheless the model range increased dramatically as new airlines were added and new moulds created. During the 1980s it was common to see Schabaks sold in airports, on board airliners or in model shops. Early models, continuing on from their Schuco heritage, were built with large wheels that rolled and were finished in natural metal. Some (probably the earliest) had all big wheels while others had small nose wheels. 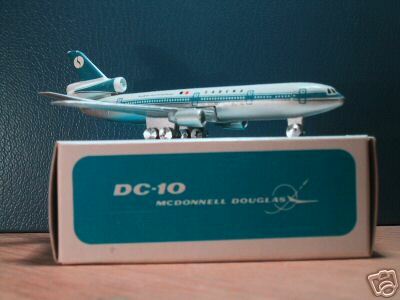 Narrow body jets like 737-200s/727s and MD80s had all small wheels little changed in scale to the later black plastic wheels. Windows were mainly black except where the livery didn't allow it (i.e. Northwest Orient, Worldways etc usually where there was a dark cheatline). 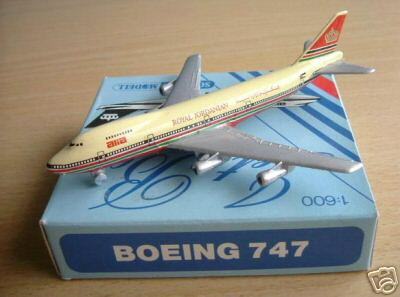 The earliest boxes were all in the same blue jet box colours but later specific boxes appeared for each airline. Changes appear to have happened piecemeal and I have found aircraft with plastic small wheels in jetbox boxes and large wheel aircraft in their specific airline boxes. This makes it very difficult to actually pin down the dates of design changes and Schabak never really seemed to know what it made when! The early models were often finished badly and it is common to find even fairly late models that are not to a high standard or have decal mistakes. 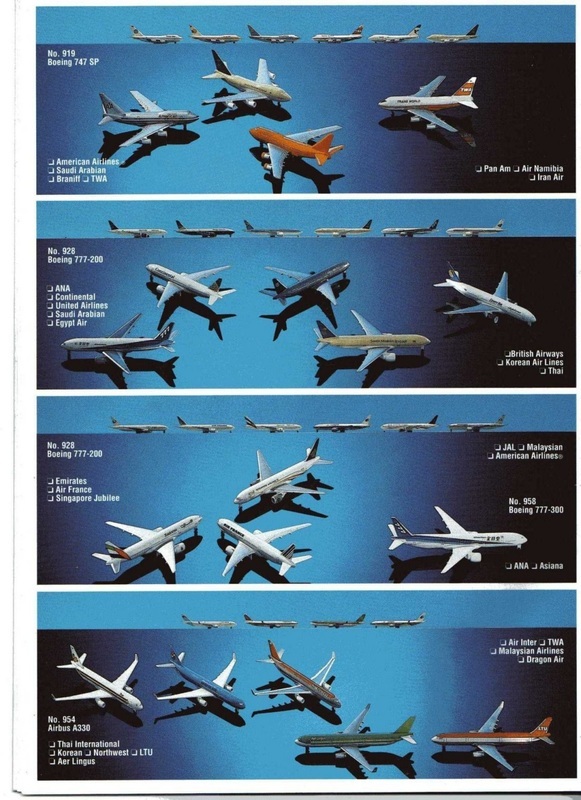 The range of airliners produced in the 1980s included the Concorde, Viscount, 707, 727-200, 737-200/300, 747-100/200/300, 757, 767-200, A300, A310, DC3, DC8-70, DC9, DC10, DC9-80, L1011, L1049, CV440, F27 & F28. Even then the introduction of some of these types took some time and at least in the case of the A310, models can be found that are clearly meant to be A310s that are decaled onto A300 bodies (KLM, Swissair). This continued to a lesser degree with 767-200s that were meant to be 767-300s (Lauda Air, Canadian) and later with A330s and A340s (as the shorter 200 series aircraft were not produced). Alongside the boxes Schabak also made models in vacuum packs on a card base. 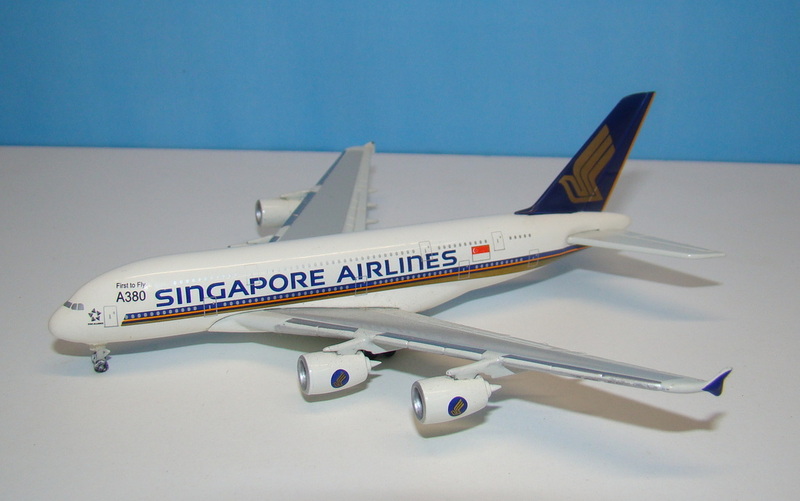 In 2002 I saw in Singapore that models were still produced this way but with the box within the vacuum pack. Schabak has also always produced airline box sets of 2/3/4/6 models of the same airline primarily for the onboard sales market. Early Schabaks appear to be seen as toys rather than models. As the 1990s were entered the models were improved greatly. Models post 1990 came with far better small black plastic wheels, silver windows instead of black and plastic bags instead of paper wrapping. 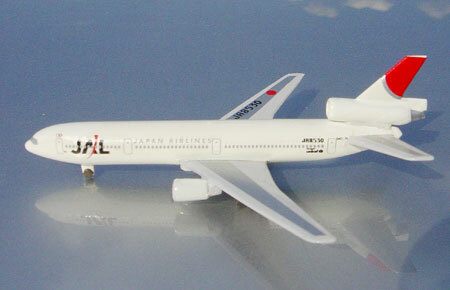 Many new types were introduced (A320-100/200, A330-300, A340-300, 737-700/800, 747-400, 757-300, 767-300, 777-200/300, IL62, IL86, IL96, TU154, TU204, ATR-42/72, BAE 146, DC4, DC6, MD11, MD90, F100, CRJ and Caravelle) and several older styles revamped completely to take into account the new wheels (including the 747-200/300/400, A310 and the 737-300). The MD80 mould was also changed to add the larger MD90 style engines but annoyingly even when they were still supposed to be MD80s! These continuous changes mean that there are a huge variety of models available beyond the different airlines and types. Schabaks became more model like through their development and the company in noting the collectors market started to introduce historic models and special limited edition Silver Wings models. Despite these improvements however Schabak never really overcame the variable quality that using stickers rather than printing created and gradually they started to disappear from shops, being outcompeted by larger scales and better quality models. In early 2006 the end finally came and Schabak went bankrupt, however the company was bought by the resurgent Schuco who introduced tampo printing rather than decals which raised the quality substantially. 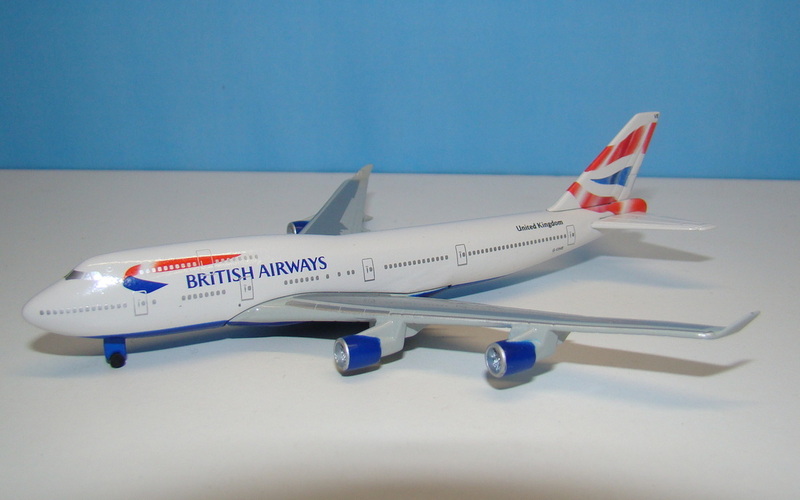 They went on to release lots of new models and some new moulds including the A340-600, A380, 747-400 and Concode. Unfortunately in 2012 the factory that made the models for Schuco went bankrupt and all the moulds were seemingly lost. Schuco created a small set of new moulds but they were inferior to what went before and the number of releases dwindled as they seem to have lost their remaining marketshare in the intervening period. Schuco still release new models but the numbers are tiny in comparison to the old days and the price of the models very high. 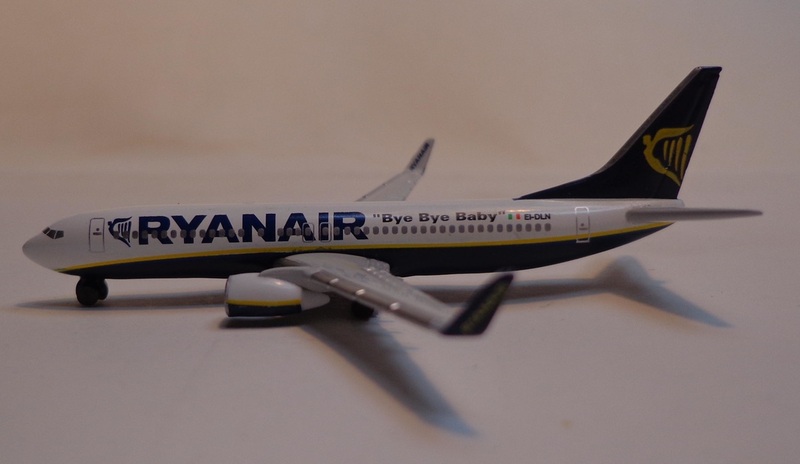 In fact the new models are often as expensive as much superior 1/500 and 1/400 scale models.